Real Tuff Livestock Handling Equipment is built to last. Our featured products are below and to the left you will see all of our products. 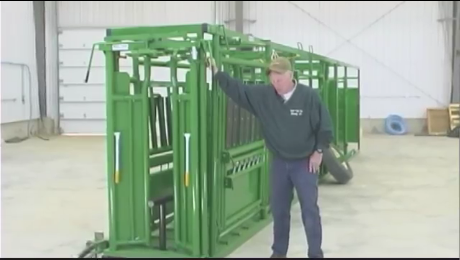 We love talking about our livestock handling equipment. Give us a call today! 218-776-3188 or 800-474-6016. Real Tuff believes that each piece of equipment should meet the standard of being safe, strong, and simple. Our customers want equipment that gets the job done while withstanding the test of time, so that’s what we build. 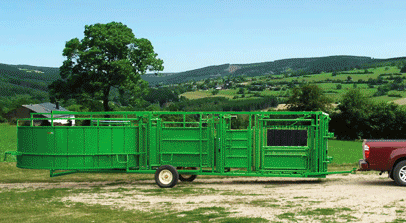 This is the fast and easy way to move to remote pastures and yards. The video below shows the Real Tuff portable system demonstrating the Squeeze Chute, the Adjustable Alley and the No Corner Tub. Real Tuff strives to keep up with current trends and adapts to changing customers needs. Please keep in mind that the equipment shown in this video may have been updated or slightly changed since filming to meet our customers needs. As you may have noticed, our equipment looks similar to another brand on the market. They say imitation is the best form of flattery, but if you want the best, buy from the original, Real Tuff Livestock Equipment! Dave and Al’s own cattle impact our design improvements and equipment changes. Consequently we’re on top of the market because we’re cattlemen just like you. Stearns Bank Offers Financing for Real Tuff Equipment!